Good morning… Below is a page that will appear in MPNforum Magazine February 15. 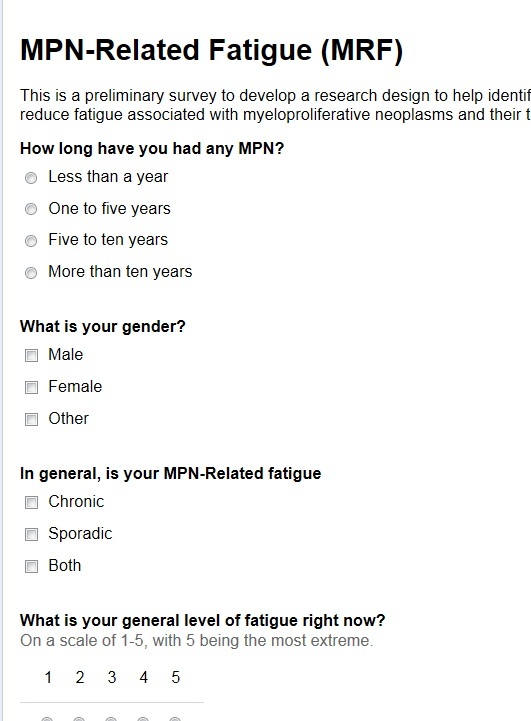 It’s being sent to you for a first response to the MPN-Related Fatigue (MRF) Survey. The survey form (see below) is live and data will be collected and become part of the first MRF database, a critical component of the Fatigue Project. Please do complete the questionnaire. It takes just a few minutes… And pass along any feedback either in the Comments box, below, or e-mail any member of the Survey team. 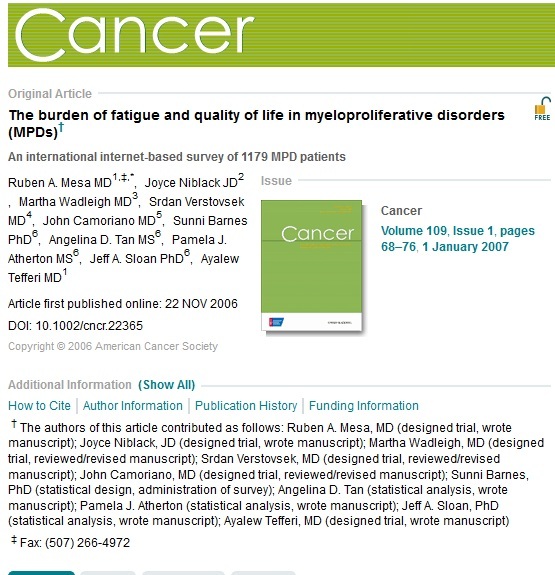 Many thanks… this is a critically important work affecting the life quality of nearly all MPN patients. The form asked to rate the last 24 hours fatigue on a scale from 0 – 10, but there was no zero which I would have chosen. 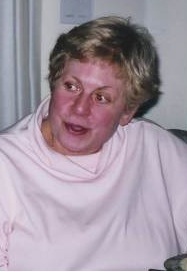 The question “How long have you had any MPN?” Would have been better worded, “How long have you been diagnosed with any MPN?” I am convinced that I had one many years before diagnosis, but can’t say for sure. I certainly had some crazy/freaky symptoms that were either ignored by my MD or not reported to one, but are probably relevant. I didn’t mention it in the survey, but stress/happiness is definitely related to my bouts of fatigue. I have completed the form. I just want to say that I am fortunate to own my business and I work at it daily. 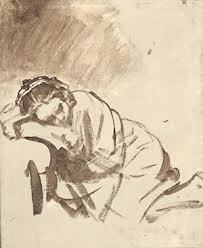 Some days are worse than others but on the whole I think that keeping busy is a very important part of therapy for fatigue.